OLD PARKED CARS. : 1972 Mercury Comet. This apparently flawless Comet owes a lot to its white paint, which upon scrutiny is riddled with the wonderful patina of careful but unrestrained use. It must have lived a garaged life. The top is very nice but also not perfect. As my boss Chester says every time the car appears in the Subway parking lot across the street from our office, "Don't you think it has to be the best original Mercury Comet sedan in the world?" I don't think the half-joking question is far-fetched. I will note the odometer reading next time and update this post. 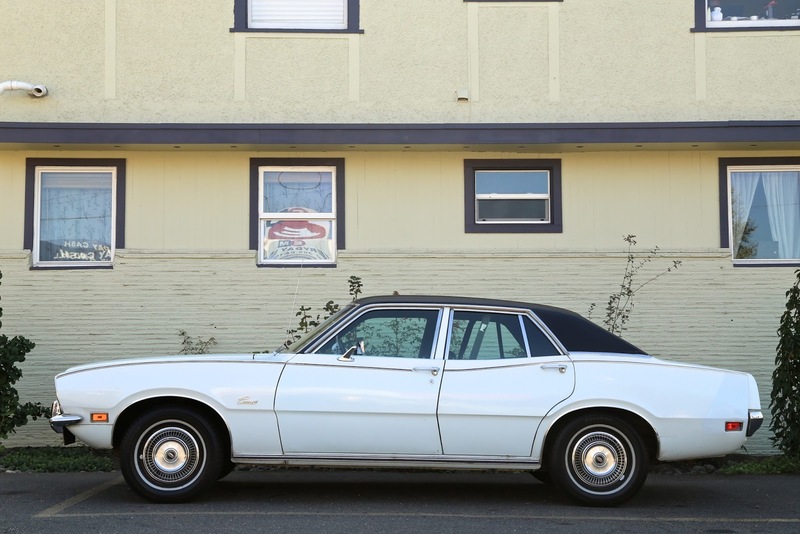 Portland's cloudless summer skies make shooting any white car a challenge, and I'd been waiting to capture this one in the right light. I couldn't believe when it chose this parking spot yesterday. It's not often photos in shadow can look so appealing. I love the way the reflected sunlight warms these compositions. That is totally cool. Also, your introductory comments enhance the experience of looking at the photos. Wouldn't have thought to consider the effect of the reflected sunlight. 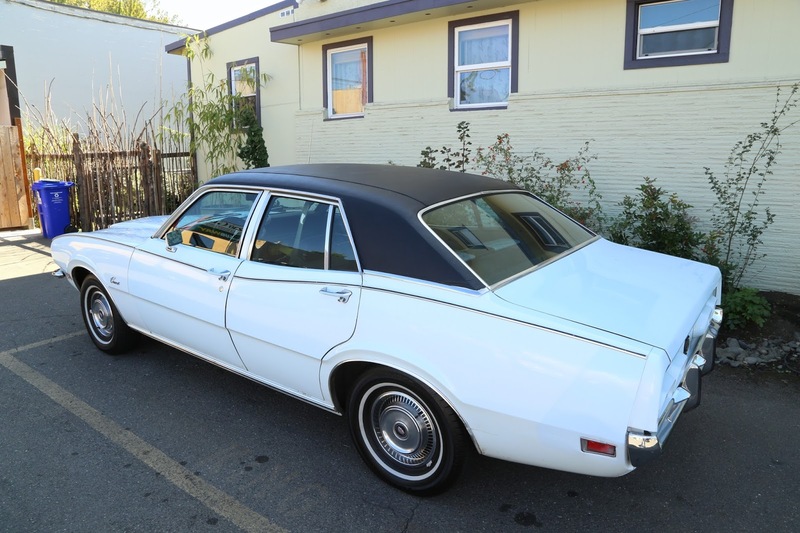 My folks had a '75 model that was similar to this one. It was Copper with a cream vinyl top. 1980's. Nice to see one that's still in such great shape! 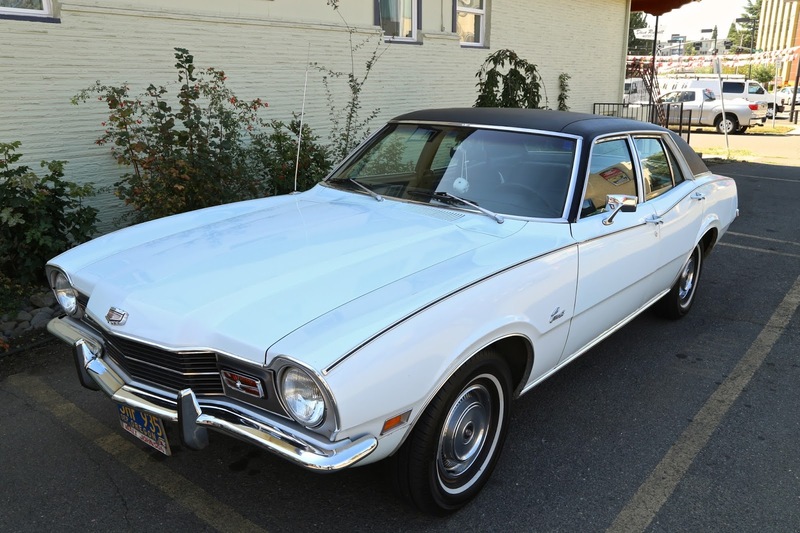 I think the plain styling of the Ford Maverick and its clone, the Comet, are anything but timeless. These were humble cars, but they sold very well back in the day. Nowadays you rarely see any of them, especially ones like this very well preserved Comet. The Ford Granada/Mercury Monarch and the Lincoln Versailles were based on this platform.